In early February 2010, mosaic images of the Herbig-Haro 901 and 902 (hereafter just HH 901) star formation sites were obtained using both the visible (UVIS) and infrared (IR) channels of the new Wide Field camera 3 (WFC3), which was installed by astronauts during Hubble Servicing Mission 4 (SM4) in May 2009. The multiple jets in this region emanate from prominent pillars carved out by the nearby Trumpler 14 star cluster within the huge Carina Nebula (NGC 3372). The new WFC3 observations include four pointings in a 2x2 mosaic pattern, with small dithers within each pointing to fill the gaps between the two CCD chips, and allow for the rejection of cosmic rays and detector artifacts. A mosaic image was also obtained for a parallel field, using the Advanced Camera for Surveys (ACS, which was repaired during SM4) This new ACS F502N mosaic overlaps an older ACS F658N mosaic. From the HST 20th Anniversary Press Release. Many smaller nearby fields were also imaged, including the spectacular Herbig-Haro object HH666 and the nearby NGC 3324. The primary ACS data are all with the F658N H-alpha and [N II] filter, and the parallel WFPC2 data utilize the F656N H-alpha filter. In 2008, the Hubble Heritage Team also obtained WFPC2 mosaic data for NGC 3324 (HST proposal 11800) with the [O III] and [S II] filters (F502N and F673N). 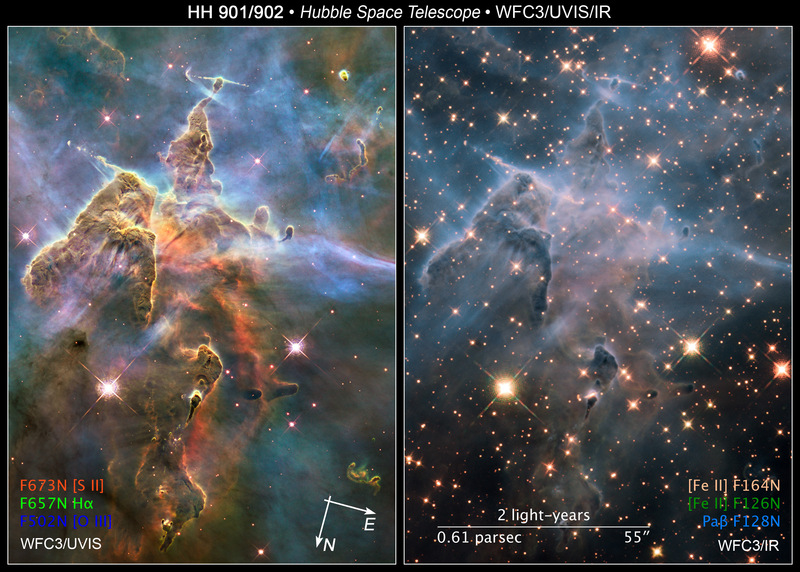 The resulting color composite image was released in October 2008 to commemorate the 10th anniversary of the team: http://hubblesite.org/newscenter/archive/releases/2008/34/. Support for production of this set of High Level Science Products was provided by NASA through grant number 11765 (PI Max Mutchler) from the Space Telescope Science Institute, which is operated by the Association of Universities for Research in Astronomy, Inc., under NASA contract NAS5-26555. Readme file describing the data and processing.